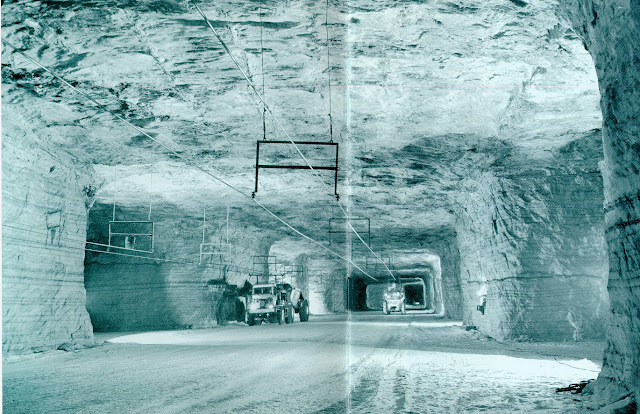 There's a salt mine 1,200 feet below the surface of Detroit, Michigan. The salt mines spread over 1,400 acres and have over 50 miles of roads that cover them. The salt bed actually spreads across Ontario, Michigan, Ohio, Pennsylvania, New York, and West Virginia. It is estimated that the salt mines are so large that they could last 70 million years supplying us. Glaciologists believe the salt was created when a huge sea covering the region evaporated more than 400 million years ago, forming salt deposits which were gradually buried by glacial activity. Salt flats are dried-up desert lakes. They form in closed hollows where rainfall can’t drain away. In a wet climate, a lake would form but, in a desert, the water is heated and evaporates into vapor faster than it is replenished by rain. The salt and minerals dissolved in the water are left behind as a solid layer. Some salt flats are massive. Bonneville Salt Flats in Utah, USA, were formed by the evaporation of an ancient lake as large as present-day Lake Michigan. They are flat enough to be used as a raceway for setting land-speed records.